Thomas Bergeron is one of those trumpeters who does it all – and really well! As comfortable in the jazz world as he is in the classical world and in the creative contemporary music world, he continues to blur the line of what these genres might even mean to someone. This is why we are big fans of him here at FONT Music. Hey Thomas, thanks for chatting with us a bit today, we’re really excited to experience your show in couple weeks at The Dimenna Center – we’re so glad to have you on the program this year. I was surprised to hear this is your first time presenting with us. You are a great example of a “Crossing Genre Artist” we like here at FONT Music. We’ve found that FONT Music means different things to different people and artists, what does it mean to you? I’ve been an admirer of FONT Music for years, and has become an important and influential force in the creative trumpet community, and I’m thrilled to be a part of it. To me, FONT Music is one of the most forward-thinking “New Music” festivals because it recognizes and embraces the many forms and genres that should fall under the heading of “New Music”, and focuses on the post-academic paradigm where performers are composers and vice-versa. Right, that’s a great point about the performer being the composer and vice versa. In our community, you rarely are seeing the sole “composers”, but more so the performer is writing for themselves and others they are closely related to. In some ways, it becomes a bit more personal that way I suppose. Because Dave is such a model for me as an artist, as soon as “Sacred Feast” was finished, I sent the tracks over to him. I assumed that I was one of dozens of artists sending him material every week, so didn’texpect a response. He not only listened to it, but wrote me an email from the airport with his thoughts! How cool is that? This meant so much to me, and again shows how committed Dave is to supporting young artists and trumpeters. I was obviously thrilled when he asked me to perform at FONT Music this year. I hope that in time I can pay it forward by supporting future generations of FONT Music artists. Dave Douglas has long been a huge creative and professional inspiration to me, and this Festival is a perfect example of why that is. On top of being a prolific creative force, stunning improviser, and virtuosic trumpeter, Dave is devoted to furthering the art form by supporting other creative artists, especially trumpeters. Yeah, Dave’s a pretty amazing guy! So, for those of us new to Thomas Bergeron, can you give us a brief history? What have we missed thusfar? This is a loaded question! I spent a good portion of my early years working in the classical world, both orchestra and chamber music. During this time I was mostly focused on honing my trumpet playing. Because I was taking orchestra auditions (and every freelance gig felt like an audition), I became obsessed with developing my sound and perfecting my technique. I soon realized that sound development and technical work would be never-ending pursuits. It wasn’t long before I grew hungry for more creative outlets. I had played jazz for as long as I was a trumpet player, but after college I became more intensely interested in improvising and composing (and their intersections). It wasn’t until I arrived at Yale for graduate school that this became a career focus. Yale is primarily focused on classical chamber music, but there were a few fantastic jazz musicians in the program (and luckily for me they were rhythm section players :)). We put together a small jazz group, which provided an oasis of creativity for me. I wanted to convince the school that jazz performance practice had a place within their established chamber music curriculum. My strategy was to arrange jazz versions (written for jazz players) of the music of classical composers like Debussy, Villa Lobos, Chopin, and Ravel. I love it – change the system from the inside out! Including your musical history and interests creating something unique. And this brought you to your first album? My first jazz album interpreted the music of Claude Debussy (“The First of All My Dreams“). I was encouraged by the response to the music, especially when we performed live. We would constantly hear jazz fans saying they didn’t realize how cool Debussy was, and classical fans saying they never thought they’d enjoy a jazz show so much. While I was working on this creative outlet in the jazz realm, my classical career continued to have a life of its own. I’m now going into my fourth season as principal trumpet with the Springfield Symphony, my third season with the Atlantic Brass Quintet, and I recently finished a two-year residency at Carnegie Hall with Ensemble ACJW. Working with these ensembles is of course immensely rewarding, not only because I get to perform alongside some of the worlds greatest players, but because I’m constantly exposed to some of the greatest music ever created. As a composer, jazz musician and improviser, I feed heavily off of the music that I’m exposed to in classical settings. Wow – you’re ALL over the place musically, that’s so cool! And you’re drawing all areas of your musical interests into your creative playing and writing! So unique and personal! What can we expect next from you? While promoting “Sacred Feast“, I’m always thinking about new material. I’m currently working on some ideas for smaller jazz groups (trios and quartets), and I’m also writing some new music for the Atlantic Brass Quintet. 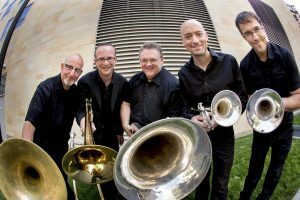 This is exciting to me because Atlantic is a traditional brass quintet made of up virtuoso players, but most of the players are also stellar improvisers with firm footing in the jazz world (like our trombonist Tim Albright, for example). The variety of skill sets in the ensemble opens up a lot of doors compositionally. I tend to pick a point on the horizon to sail towards, but allow the winds to blow me to a new course if they want to. So who knows, man? In general just trying to stay creative, stay healthy, and continue working hard to serve the world of music. Yes… serving the world of music, that sounds about right. Do you have any big classical projects coming up? As for nerve-wracking classical projects … there are a few coming up. Most notably, I’m performing the Haydn Trumpet Concerto, as well as Copland’s Quiet City with the Springfield Symphony in November (along with Handel’s Music for the Royal Fireworks … yes all on the same program … yikes). So, Sacred Feast is your newest album out taking a “different” look at the music of Messiaen. Can you give us some insight? I became captivated by the music of Olivier Messiaen when I was studying with one of his students, Joan Panetti, who teaches a course at Yale called “Hearing”. What struck me most was his ability to manipulate harmony and tone color to magical effects. Messiaen was known as a mystic, and perhaps more famously as a devout Roman Catholic (someone tell the Pope this concert is happening on the day he’s in NYC!). Right! He’ll be a half mile away from you when you’re performing “Sacred Feast” – we’re seeing that as more providence than coincidence here. We’ll save him a seat. Seriously … Tell the Pope this show is happening while he’s in town. He will love it. He probably already loves Olivier Messiaen’s music. If he hasn’t heard of Olivier Messiaen, he should. If ever there was a Pope in history who would enjoy a jazz Messiaen show, it’s Pope Francis. We totally agree. We’ll see what we can do … Speaking of spiritualness of the music, how does the music affect you? I am not a religious person per se, but Messiaen’s music takes me to a place that I can only describe as spiritual. That’s why I created this project. I wanted to expose people to his music who might not otherwise find it. The band has only sunk deeper into the music through the numerous performances we’ve given since the recording sessions (I’ve often thought that bands should re-record their albums at the end of the tours that promote them. It could be like a musical version of one of those before/after pictures in weight-loss ads). Ha! Yeah, the music evolves so much over time – that’s actually kind of a cool idea. The before and after musical shots… I’d be totally interested in hearing something like that. Tell us a little bit about what to expect on Sept 25th for your concert at The Dimenna Center (Benzaquen Hall) for the Festival? This FONT Music performance has turned into quite a special affair, with the addition of a fantastic string section and the brilliant Becca Stevens (who sings a 3-part song cycle of Messiaen’s on the record, in addition to his Vocalise). The icing on the cake is that my friend and Pakistani tabla master Yousuf Kerai will be in town that weekend, so I’m re-arranging a number of our pieces to allow him to join us. I met Yousuf while visiting Karachi in January. Just a few days after meeting him, we put together a concert with some local musicians in which we combined Eastern and Western musical practices. Yousuf is the real deal when it comes to tabla. He grew up in Pakistan and studied with Ustad Khurshid Hussain. I remember him describing tabla as a “means of discourse”, which is a particularly apt description in the context of our collaboration. It’s been such a pleasure talking with you, and we can’t wait to hear this pretty special concert! Thank you for supporting contemporary music and people crazy enough to devote their lives to playing the trumpet. You’re making the world a better place. We seem to think so too – glad you agree! Okay, so if we DO get a hold of The Pope, how can we entice him to stop by? My suggestion, if you have his ear:“Excuse me Your Holiness, there is a concert happening across town tonight entitled ‘Sacrum Convivium’ (use the latin, trust me). Music inspired by the great Catholic composer Olivier Messiaen, including performers from Pakistan, Japan, and the US. Would you like to attend?”How could he say no? Well, if you didn’t convince him, you’ve convinced me! Thanks Thomas! 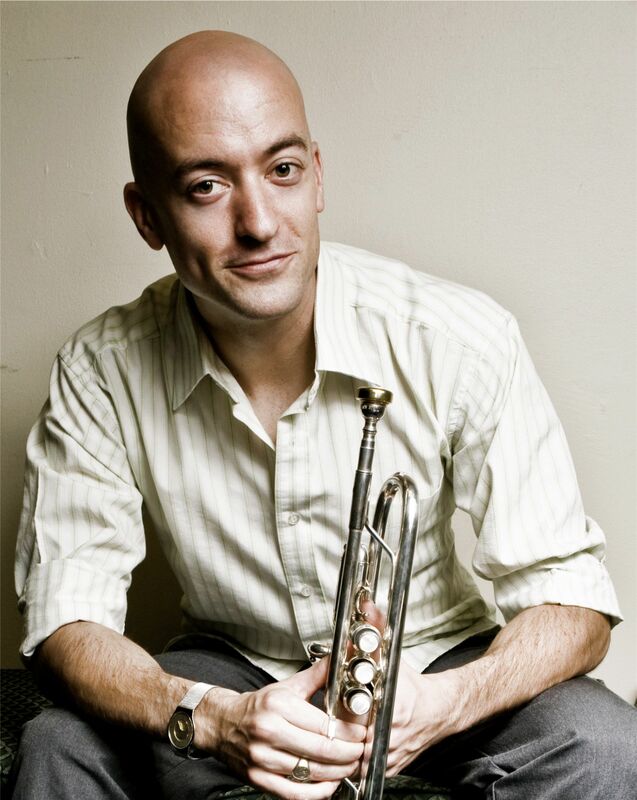 Thomas Bergeron’s Bio: A trumpeter, composer, producer, and educator known for excelling in both the jazz and classical realms, Thomas Bergeron exemplifies a new breed of 21st century artists. 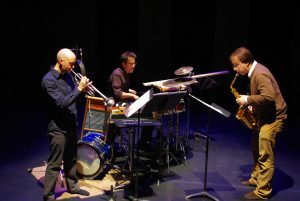 In addition to his own hybrid jazz chamber ensemble, Thomas performs as a sideman with many jazz groups in NYC, is member of the Atlantic Brass Quintet and principal trumpet with the Springfield Symphony. He recently concluded a 2-year residency at Carnegie Hall with Ensemble ACJW, and has performed with Vampire Weekend, The Danish National Symphony Orchestra, The American Symphony, The Temptations, Idina Menzel, Judy Collins, Jon Irabagon, Arlo Guthrie, Ernie Watts, and the Radio City Christmas Orchestra, among others. His network television appearances include Saturday Night Live, Jimmy Kimmel Live, and CBS This Morning.As an educator, Thomas is dedicated to sharing music in communities that would not otherwise be able to access it. He currently teaches inmates at Sing Sing Maximum Security Correctional Facility through Musicambia, and is an educational consultant for The Harmony Program in New York City. Thomas has held teaching positions at Williams College, Bennington College, Yale, and Amherst College. 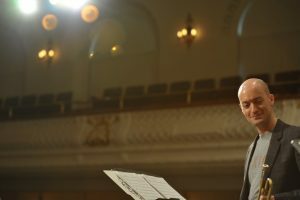 He holds two advanced degrees from Yale, where he won the Woolsey Hall Concerto Competition and received the John Swallow Award for excellence in brass playing. He also holds a business management degree from UMass Amherst.Thomas is a Conn-Selmer Artist, performing on Bach Artisan Stradivarius Bb and Eb/D trumpets, the Bach Stradivarius Chicago C trumpet, and the Conn Vintage One flugelhorn.